Pyhan Asteli is a remote, holiday village in the heart of the Santa’s Lapland. In Pyhan Asteli it is easy to see why Father Christmas has made this beautiful region his homeland. Join Santa’s Special Elves, Snowy Bowy, Tricky Dicky, Noisy Nod and Speedy Sam, on a fantastic fun-filled journey, searching for Santa Claus. The excitement builds as you board your flight from Manchester to Rovaniemi Airport. On arrival in Lapland our dedicated tour guides will be waiting to greet you and your family, then it’s time to board the coach for the journey to Pyhan Asteli. A brief stop will be made enroute to resort to collect your thermal snow suits and boots. After checking in to your log cabin this evening, enjoy the welcome dinner in the restaurant. After breakfast, your search for Santa begins. Visit the Elf House, will Noisy Nod or Speedy Sam be at home today? Will they provide you with a clue as to where Santa may be? This magical holiday to Lapland will enable you to experience traditional Arctic activities as you search for Father Christmas. Enjoy a relaxing reindeer sleigh ride through the forest at the farm and there will even be time to listen to a talk from the reindeer farmer and to feed some of the animals. A never to be forgotten experience. After a hot lunch we will continue our search for Santa. Will we bump into Speedy Sam? This trusty helper races around Lapland organising things for Santa. Enjoy some snow games with the Elves and carefully listen to any clues they may give you as to where you may find Father Christmas. On return to Pyhan Astelli make the most of the snow and enjoy some tobogganing or watch the childrens’ entertainment in the restaurant prior to dinner. It’s time to sing the Elf Song as we continue our search for Santa. Today we’ll see where Santa’s Elves sort the mail and we’ll meet the gallant huskies at the husky farm. Meet some of the dogs and learn about how they survive the cold winters in Lapland, then experience a thrilling husky safari either as a driver or a passenger. Will the huskies lead you to Santa? When you finally discover Santa’s secret home, Mrs Claus will be waiting to greet you. Each family will have a private meeting with Santa, where naturally the children will receive a Christmas present from him. Spend your last morning in Pyhan Asteli relaxing with a sauna or playing on the tobogganing slope. After lunch, it will be time to say your farewells to Lapland. Join your coach guide in singing the Elf Song on the journey to Rovaniemi Airport. Pyhan Asteli epitomises the authentic Lapland that we love. At Pyhan Asteli you can stay in a beautiful forest setting in the heart of Santa’s Lapland. 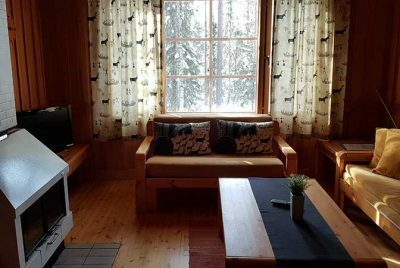 Situated 136 km north of Rovaniemi, Pyhan Asteli is very quiet and secluded and the village offers a traditional, family friendly environment, ideal for those with younger children. The perfect setting for a classic Lapland Santa holiday. The traditional log cabins in Pyhan Asteli are just a short level walking distance to the restaurant for your meals. Also, less than 10 mins’ walk to the tobogganing slope. The Log Cabins in Pyhan Asteli village are suitable for families of 4 and comprise 2 twin-bedded rooms, a lounge with log fire and kitchenette, plus a shower room with sauna. The traditionally styled restaurant has open views to the forest and also plays host to our children’s entertainment in the evening, prior to dinner.